Co-Counsel Success Story - Swope, Rodante P.A. 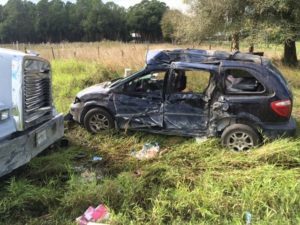 In January 2016, an army veteran was driving on a two-lane highway in Florida when his minivan was t-boned on the driver side by a dump truck. The client was catastrophically injured and rendered a ventilator-dependent quadriplegic as a result of the collision. The client’s case initially looked unwinnable, as there was strong evidence that he was at fault for the collision. The dump truck driver testified that the minivan had unexpectedly turned left in front of him while he was attempting to pass in the opposite lane, and the client was ticketed for breaching the dump truck’s right of way. The physical evidence also suggested the dump truck driver could not have done anything to avoid the collision. There was even evidence that the client was unbelted and driving from with his left leg and hand from the passenger seat at the time of the collision. To make matters worse, the dump truck driver’s insurance company initially claimed there was only $300,000 of liability insurance available to compensate the veteran, whose medical bills were in the millions of dollars. However, piece by piece, the Swope, Rodante attorneys began to deconstruct the dump truck driver’s story, uncovering evidence to prove that the dump truck driver was inattentive, on his cell phone, when he began to pass another dump truck which had slowed because the client was executing a legal left-hand turn. They also exposed that the dump truck driver’s insurance company was misrepresenting the amount of available liability coverage, and had acted in bad faith by refusing to settle for the $1 million policy limit. After years of hard work and tireless fighting, Swope Rodante and Goldberg Noone teamed up to achieve a settlement of $12.5 million for the veteran and his devoted wife, providing them with financial security for life.